Open the Andes Thin Mints green foil wrapper and you will find a three-layer chocolate, mint, chocolate candy. This after-dinner mint has been a best seller since it was introduced in 1950. Today Andes Thin Mints come in four flavors and there is a sugar-free version of the original Crème de Menthe mint. After Tootsie Roll acquired the company in 2000, Andes Crème de Menthe and Peppermint Crunch baking chips came onto the market. The ingredients of Andes Mints include those found in chocolate. Cocoa comes from cacao seeds. The seeds are roasted and cracked. The fat, cocoa butter, is removed, leaving cocoa. 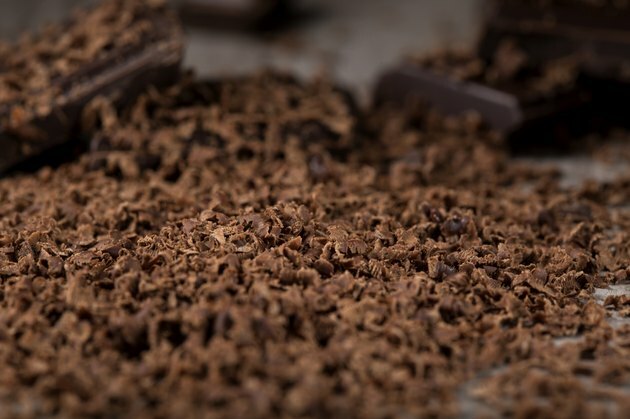 In a process called Dutching, cocoa is processed with alkali to create slightly different flavors. After shipping cocoa powder, palm oil or cocoa butter is added back to cocoa to make chocolate. Andes Mints uses palm oil. For chocolate which is neither too hard or too soft, but melts in your mouth, the right blend of palm oil needs to be used. Palm oil comes from the fleshy fruit, while palm kernel oil comes from the seed pit or kernel. Andes Thin Mints have both types of palm oil. To make chocolate more solid, the palm kernel oil is processed to have hydrogen added. Palm oil is a rich source of vitamin E, according to the American Palm Oil council. Adding sugar and milk to processed cacao or a mixture of cocoa and fats makes chocolate. Sugar adds the sweet taste and helps chocolate melt in your mouth. Sugar can come from sugar cane or sugar beets. To add the milk taste, Andes Mints use non-fat milk and milk protein concentrate. Andes Mints have small amounts of other ingredients including natural and artificial flavors. Peppermint oil flavors Crème de Mente Andes Thin Mints. Yellow and blue colors are used to color the center green layer. Soy lecithin is an emulsifier that keeps oil from separating from the candy. How Many Calories Are in Andes Mints? How Many Calories in Mentos Candy? What Are the Benefits of Peppermint Candy?